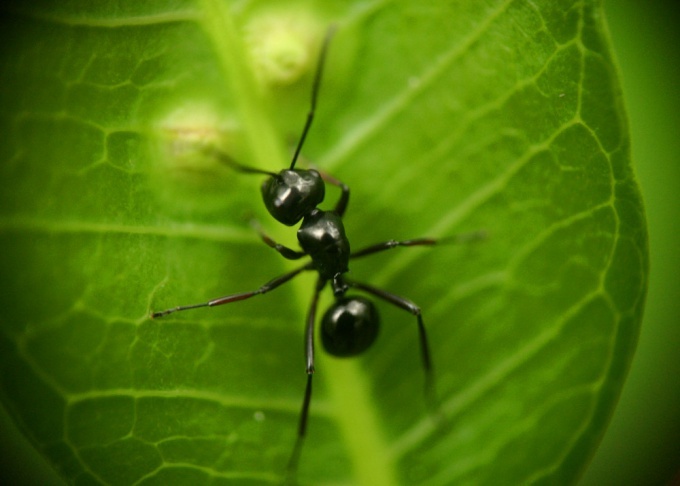 In fact, black ants do not cause much harm to trees and plants. But there is one "but": people are constantly struggling with these insects. First, they build nests in the most inappropriate places at their summer cottage. And secondly, they breed aphids, which are dangerous to fruit crops. However, ants can appear not only on your land, but also in the apartment. So how to deal with this scourge? There are many reasons why you need to deal with black ants. They take care of aphids and protect it from enemies. Transferring aphids on Mature trees and young seedlings, the ants cause tremendous harm to the garden and the garden. Black ants do not like vegetable oil, so it is recommended to pour on a frequently visited place and on the ant trails. The main way of fighting is to destroy the uterus in the anthill, then lost the meaning of his existence. Worker ants will gradually die, as they will not need and stopped reproduction. To start the control of ants is necessary in autumn – end of October – beginning of November. Since at this time the insects are in hibernation. And if you destroy their home, they will not have time and effort to restore it. Take a shovel and cut off as if the earthen a bunch over by the anthill. The ants are already at the bottom of the soil, in burrows and shelters. You will immediately discover the hole and moves, turn on the water (preferably hot), Zaglebie drill into the ground and turn up the pressure. Anthill may take 50-200 liters of water, water it until then, until it forms slurry. Seal the soil with their feet, so you press the ants. There are plenty of smells that can't stand ants: tomato tops, spoiled lemon, anise, cloves, the leaves of the elder, Artemisia, wild mint and parsley. All these flavors will become unbearable for the ants, and they leave his place of residence. Wipe ant trails with a slice of fresh garlic. Packages and the edge of the dish brush with sunflower oil – the smell is also unbearable for the ants. There is one effective method of dealing with black ants, both at home and at their summer cottage. For this you will need these forest ants that hurry to leave the room and get the black ants behind him. The result will exceed all expectations. Take a jar or glass and make a sweet syrup, it can be water with sugar or honey. Put it near the habitat of the black ants. They will gather in the bowl. Will only pour the sweet contents of the Cup into the toilet. To deal with ants in the apartment is quite difficult. The ant nest is very small, and it can be anywhere: in the wall, behind the baseboard, under tiles and in other similar places. As practice shows, the ants as their home very often choose the cardboard box. But how to deal with household ants folk remedies? To do this, mix equal proportions of sugar, honey, water, borax, glycerin. The resulting mixture was spread on metal lids or saucers. Borax can be bought in any pharmacy. With the same purpose you can use cinnamon, yeast, vinegar.